* Loss of utility service to your premise, caused by incidents off your property, such as: vehicle hits transformer; telephone lines are taken down by a wind storm; lightning strikes a pumping station. * Your lease fails to clearly define who is responsible for replacing the improvements you have made to your rented space. * An electrical burnout of a motor; a mechanical breakdown of a compressor; burning of a boiler due to insufficient water. Pumping stations and water mains that supply the covered premise. Property used to provide telephone, internet, radio, microwave, or television services to covered premise. Generating plates, switching stations, substations, transformers, and transmission lines used to supply electricity, steam ,or gas to the covered premise. The standard Business Income coverage of a policy provides reimbursement for income lost due to a suspension of operations caused by a direct physical loss or damage to the insured premise. What happens then if you are forced to close operations due to either loss of water, power, or communication caused by damage to water pipes, power lines, transformer, or phone lines off your premise? Coverage is available via the “Off Premise Utility Services – Indirect Damage” endorsement and will pay your loss of income plus continuing expenses up to the limit you purchase as long as the utility is out due to a covered cause of loss under your policy. This coverage is only available if you have purchased standard Business Income on your policy and will be subject to a “waiting period” (deductible). 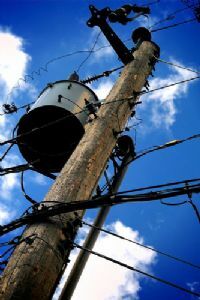 Power surges resulting from restoring utility service can cause damage to equipment. The standard property policy does not extend coverage for this exposure unless the specific “Off Premise Utility Interruption – Direct Damage” endorsement is purchased. This coverage pays the cost to either repair or replace the property damaged due to a utility service interruption, caused by a covered cause of loss in your policy, up to the limit of insurance you purchase. You may elect to have this extend to your building, business personal property, and/or personal property of others for any one or all of the following services: Water Supply, Communication Supply (including or excluding overhead transmission lines), and Power Supply (including or excluding overhead transmission lines). It is vital each building on the premise be individually listed with the desired coverage. The deductible applicable to your building and or Business Personal Property typically is applicable to this coverage extension. The limit purchased for this coverage is a sub-limit of your building and/or business personal property limit and not in addition to. Many leases allow a tenant to make betterments and improvements to their rented space. Often the improvements to the structure become the landlord’s property even prior to the lease end. Since the improvements can be essential to business operations, it is important to clarify who has responsibility for replacing them if they become damaged. Carrier’s may differ in how they elect to cover a tenant’s improvements and betterments. Some may do so via Business Personal Property and others via Building coverage. Regardless of who the lease stipulates is responsible for insuring, the lease normally will include a mutual waiver of subrogation which means both the landlord and the tenant waive their right to recover damages from the other party, even if the other party may be responsible for those damages. A waiver of subrogation will not impair insurance recovery. If a lease fails to address responsibility for the betterments and improvements, it can leave the tenant with a financial loss but also can result in the landlord having a coinsurance penalty applied to their policy. This penalty would be a result of the landlord not taking into consideration the value of the betterments in their building limit thus causing them to be underinsured at the time of the loss. Even when the lease states the tenant is responsible to insure, it is in the best interest of the landlord to specifically exclude the tenant’s betterments under their policy so the carrier can not include in the value of the building at the time of a loss. Accidents and breakdowns that commonly happen to electrical, mechanical, air conditioning, refrigeration, production equipment, heating boilers, and pressure vessels are not covered by most standard property insurance policies. In fact, these policies specifically exclude mechanical breakdown, electrical arcing or damage due to a surge of electrical power, and explosion due to centrifugal force. These are the very types of accidents that have the highest probability of happening to your equipment! And that’s not all… typical policies do not cover explosion, cracking, or burning (overheating) of steam boilers or pipes. Uninsured gaps like these could mean big losses – and possibly financial disaster. Equipment Breakdown Coverage is priced to be affordable. And it is your best protection against the kinds of accidents that could cost thousands of dollars in losses – losses that would not be covered by your standard property insurance policy.